Highlights included meetings on Capitol Hill with Congressman Dave Reichert, Chairman of the House Ways and Means Subcommittee on Trade; Congressman Ami Bera, member of the New Democrat Coalition; and Congressman Darin La Hood, representative from Illinois; as well as with staffers on the House Ways and Means committee and the Senate Committee on Finance. Other high profile meetings included sessions with the White House administration, including National Security Council representatives Julia Friedlander and Andrew Lorenz; representatives of the Departments of State, Commerce, and the Office of the US Trade Representative; and with a number of industry associations including a briefing session at the US Chamber of Commerce. 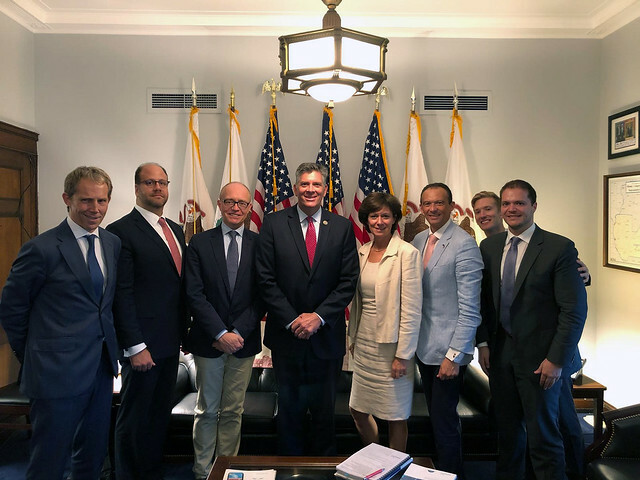 The visit also coincided with the broader Transatlantic Week coordinated by the Transatlantic Policy Network (TPN), bringing together European and American stakeholders in Washington to debate key issues facing the transatlantic partnership. Delegates were able to attend a number of panel discussions and networking events, including a reception at the EU residence hosted by Ambassador David O’Sullivan. In addition to the main programme, the delegation also focused on financial services. The group met with representatives from the Federal Reserve Board, US Department of the Treasury; the US Securities and Exchange Commission, and the Commodity Futures Trading Commission (CFTC) among others.